The tale of Freddy, a brave young penny who goes on an exciting quest. As soon as Freddy enters the world, he is filled with curiosity. His adventures begin when he makes two friends: a pretty penny named Betty and a wise quarter named George. The three friends set out across the country on an adventure, meeting many new friends and even encountering some fearsome foes. Through the characters' journey, young readers will learn about friendship, family, and more. What a cute book. And written by such a young author too. She did a superb job. It is written with wording that young readers can understand, and although there isn't much colorful pictures, the pictures that are in this book are adorable. 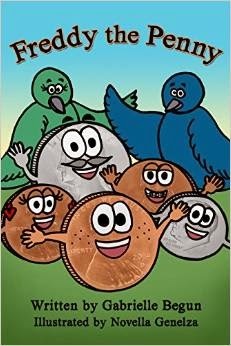 My seven and ten year loved reading about Freddy the Penny and the two other coins Betty and George) he had along his journey to meet the rest of his family.. They met other coins along their cross country journey. Some nice and than there were some that were not nice. They three coins flew on birds feathers, did some skiing, and traveled to places like Pennsylvania and Nevada. Any other places as well, all while in route to Washington DC. I am sure this is a book that will be taken out and read many more times. I will be looking forward to reading more books to come from this young author. To learn more or place an order, visit the official website http://www.gabriellebegun.com/ . You can also find the book on Amazon.